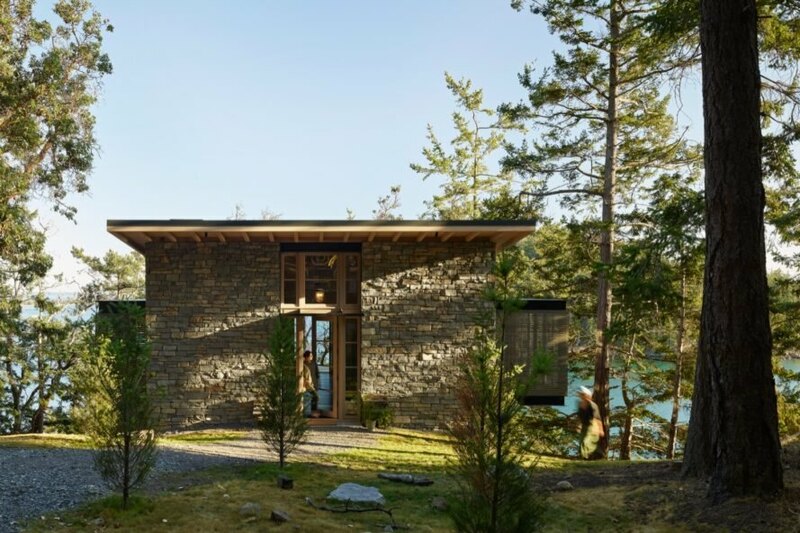 When a client commissioned Seattle-based architectural practice Hoedemaker Pfeiffer to design their new solar-powered home, they asked that the design take inspiration from a stone-and-wood retreat that they had lost to a fire decades ago in the hills of Appalachia. 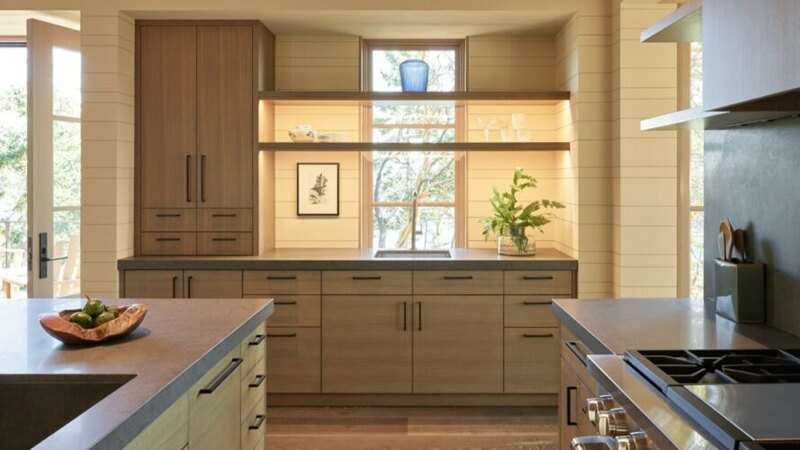 As a result, the new build takes cues from the client’s former property as well as its location on a remote forested plateau atop a steep hillside in the San Juan Islands. 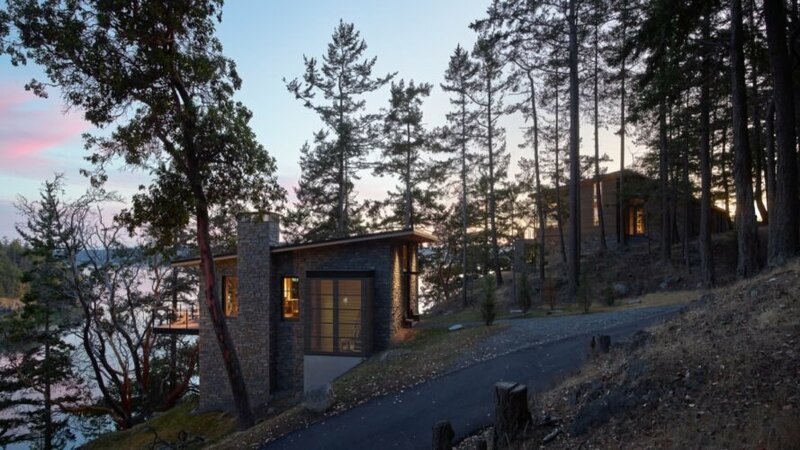 The dwelling, named Hillside Sanctuary, is built of stone and wood volumes and appears to naturally grow out of the landscape, while its large walls of glass take in sweeping views of Puget Sound. 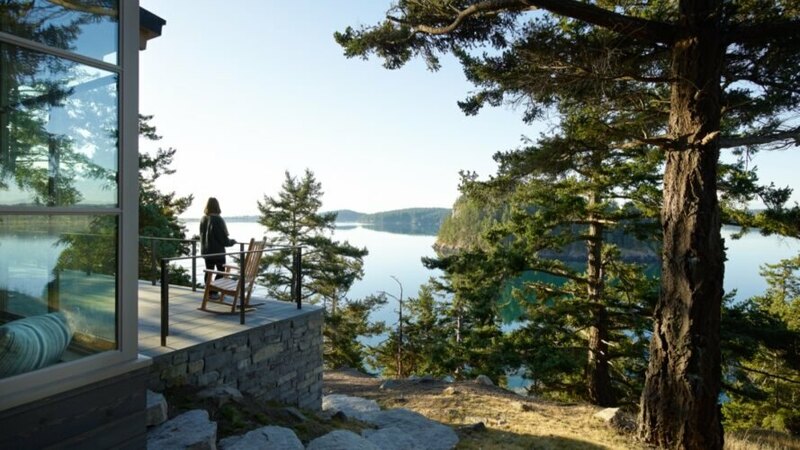 The Hillside Sanctuary comprises two buildings: a main house and a guest house, both of which comprise two floors and are oriented for optimal views of Puget Sound to the southwest. In the main house, the master bedroom and the primary living spaces can be found on the upper floor, with the main rooms sharing access to an outdoor patio. Secondary rooms are located below. The smaller guesthouse also places the primary living spaces on the upper level. On the lower level are two bedrooms and an outdoor dining area and kitchen. The bases of both buildings consist of thick stone walls topped with light-filled timber structures. Simple shed roofs with long overhangs shield the interiors from intense southern summer sun and support solar panels. Walls of glazing along the buildings’ southern elevation let in ample natural light. Strategically placed clerestory windows allow for northern light and permit the escape of warm air. A particularly impressive application of glass can be seen in the guest house dining room, which is cantilevered into the forest and wrapped on three sides by floor-to-ceiling glass. Trees were carefully preserved so as to create the room’s treehouse-like feel. Seattle-based architects Hoedemaker Pfeiffer set the Hillside Sanctuary atop of a hill. 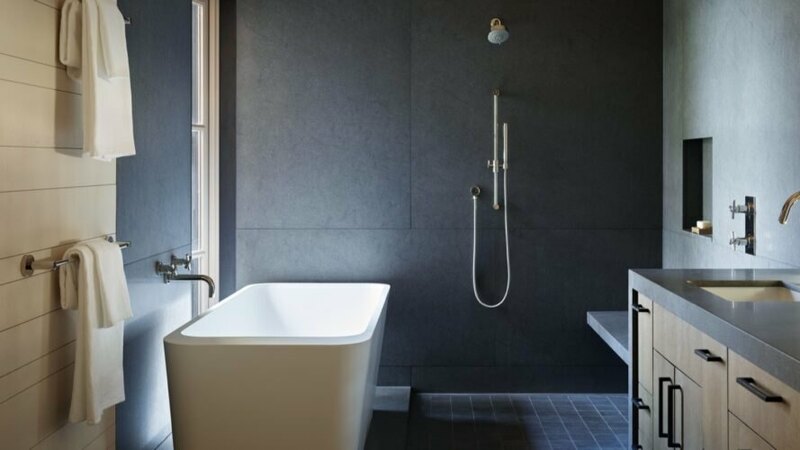 The home draws inspiration from a stone-and-wood retreat the owners had lost in a fire. The Hillside Sanctuary's remote location is in a forested plateau atop a steep hillside. The lower level are two bedrooms and an outdoor dining area and kitchen. 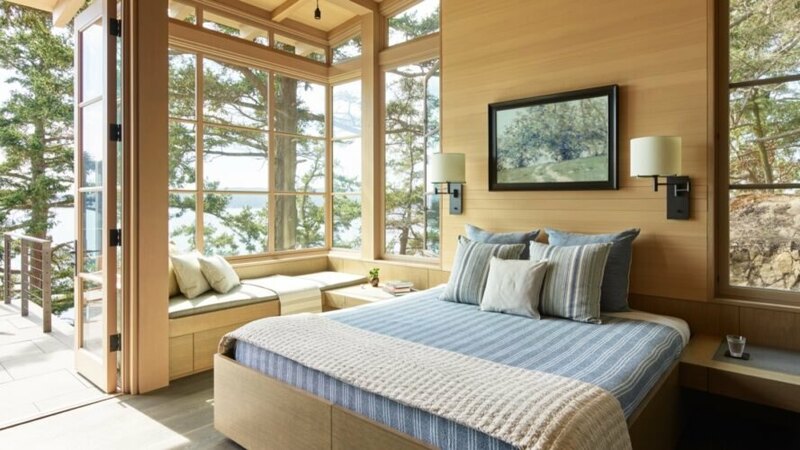 The home's large walls of glass take in sweeping views of Puget Sound. The Hillside Sanctuary comprises two buildings: a main house and a guest house. The bases of both buildings consist of thick stone walls topped with light-filled timber structures. 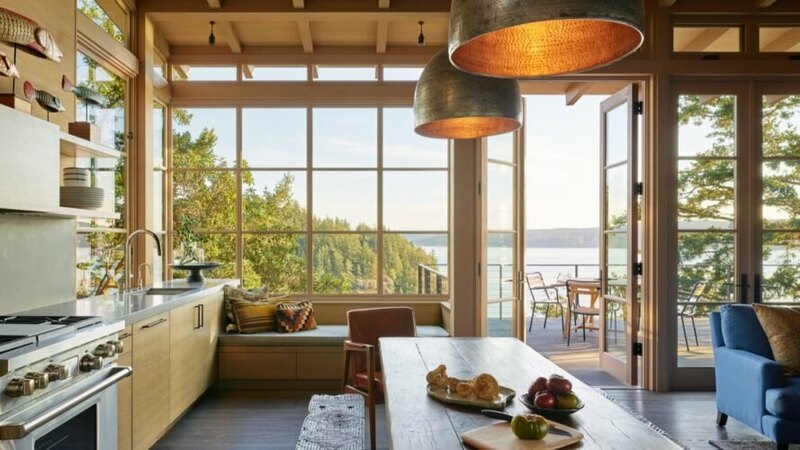 The home offers optimal views of Puget Sound to the southwest. Trees were carefully preserved to create the dining room's treehouse-like feel.